The films of Yorgos Lanthimos (Dogtooth, The Lobster) are some of the strangest in recent memory. A part of the so-called "Greek Weird Wave," Lanthimos uses the absurdity of his stories to make deeper social statements. 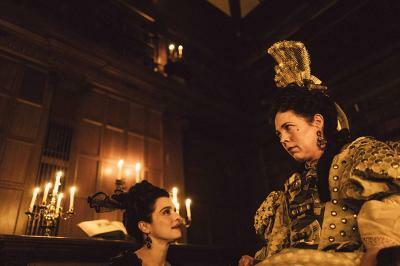 His newest film, The Favourite is both his highest-budget and most easily accessible film, but it is by no means any less sardonic. In fact, thanks to some clever writing and three brilliant performances, I think it may be his best film yet. Set during the War of Spanish Succession in the early 18th century, the film concerns the friendship between Queen Anne (an incredible Olivia Colman) and Lady Sarah (Rachel Weisz). Sarah serves as the queen's confidant during parliamentary meetings, offering her advice but also pushing her own political agendas. However, this relationship is thrown into turmoil when Sarah's commoner cousin Abigail (Emma Stone) comes to the palace looking for employment but with some hidden agendas of her own. The resulting rivalry for the queen's affections will leave all three women damaged in more ways than one.